Last month I was in sunny Portugal staying at one of our partner hotels, The Oitavos in Cascais. Situated just 30 minutes south of Lisbon, it’s such a gorgeous part of the world. I was leading a fitness retreat over there whilst doing TV special for national Portuguese channel TVI which was aired over Easter as part of their national news. I first experienced The Oitavos last year when myself and Head of Brand Amy Young flew out to meet hotel owner Manger Miguel Champalimaud. Set by the coast within a National Park and one of the worlds best golf courses it was easy to be inspired and get creative with ideas for a new fitness retreat. We’ve since returned a couple of times for meetings, photos shoots and retreats, and every time the staff are so friendly, the food is amazing, and it’s such a calming atmosphere. I love it there and I’m sure you would too! The Inner Athlete Programme I created uses the landscape and the hotel grounds. Parts of the golf course are used as a kettle bell and athletic training spaces, whilst the beach is another fitness playground for the retreat. The hotel also boasts The Fort, a luxury private villa overlooking the National Park which I use for educational talks and boxing sessions. The Oitovas is such a fun, modern, beautiful and friendly place; we love holding group fitness retreats there. 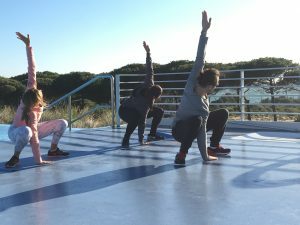 The Oitavos retreat is ideal for small groups who want to experience a scientific, fun and varied training regime. It’s luxurious with massages thrown in together with a 5* service, yet it’s affordable and serves as an amazing kick-start to gaining a more athletic mentality and body. Our next retreat is this May 18. To find out more, for availability and to book please visit The Oitavos link below.